Blue Buoy Swim School is honored to have participated in each year of this unique event. 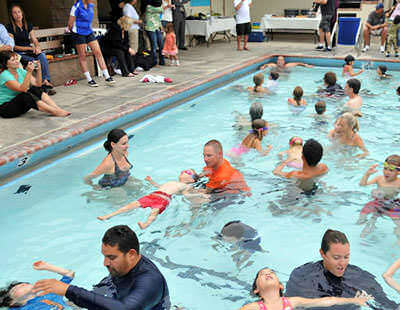 This Guinness World Record attempt invites participants from all around the world to join in a simultaneous swim lesson to promote water safety and the fact that swim lessons save lives. Organized by the World Waterparks Association, WLSL is supported by several other aquatic related organizations, including the Stop Drowning Now Foundation and its Safer 3 Program. TEAM WLSL™ holds the current Guinness World Record™ for the largest simultaneous swimming lesson conducted at multiple venues. The official record was set in 2014 with 36,564 participants in 22 countries. If we are successful in breaking last year’s total number of students, all participants will receive a certificate acknowledging that they are a World Record Holder. This event has helped bring worldwide attention to the fact that drowning continues to be a leading cause of unintentional death around the globe. It is estimated that over one million people will drown this year. Learning to swim could drastically reduce that number and we at Blue Buoy are proud to have taught over 200,000 people to swim since 1956. But we know that it takes thousands of schools and learn to swim programs to realize this goal of reducing the preventable drowning worldwide. Please support this event and join us in promoting the fact that “swim lessons save lives”!